Acoustiblok All Weather Sound Panels were installed in the Pinellas County Jail to improve sound quality in courtroom videoconferencing. arraignment and other initial appearances. Florida pioneered videoconferencing for prisons in the mid 1990’s and many states have followed suit, but like most new technology the wrinkles must be ironed out. Unfortunately, when the state-of-the-art video technology that brought the Pinellas County Jail into the 21st century was installed in 2008, it went into 20th-century concrete block rooms, the building envelope of choice for correctional institutions. And while the audio video system was working correctly, the judges were having a difficult time understanding what people were saying in these important proceedings. The problem was due to sound reverberations and echo in the room as all the concrete walls, floors and ceilings are not only parallel to each other but are also totally sound reflective. By early 2009 Win Ellwood, technology manager for the Sixth Court, concluded that something had to be done, but at the same time understood that adding carpet and sound absorbing ceiling tiles to such an institution was out of the question, and acoustical results would be minimal at best. The Acoustiblok All Weather Sound Panel” not only met all of these requirements (including its ability to be hosed down for cleaning) but had the highest sound absorption achievable in the industry (NRC 1.00). The panel was tested by the Miami Dade County hurricane testing lab to withstand 270 mph wind load! As a point of reference, 260 mph is considered the maximum level of a tornado. 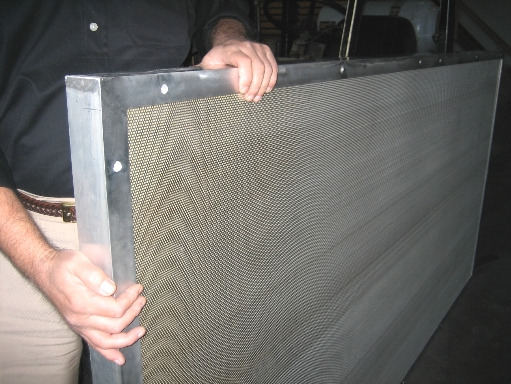 The patent pending panels are available in various sizes up to 4 x 12 foot, approximately 2¼-inches thick with aluminum frame and perforated aluminum grille, all welded, with tubular enforced islets in the frame allowing use of anchors or tapcons for wall mounting. Strike Industries of Pompano Beach, Florida, a company specializing in videoconferencing technology in correctional institutions, installed the videoconferencing technology at the Pinellas County Jail and Courthouse. Strike General Manager Patrick Sellati said the Acoustiblok installation solved numerous audio problems brought about by the complete lack of sound absorption in the jail rooms. Sellati said that videoconferencing is revolutionizing prisons across the United States, creating new options not only for courtroom appearances, but for inmate visitation and medical conferencing as well. Noise abatement solutions like Acoustiblok are necessary to best integrate the high tech videoconferencing equipment with the acoustic deficiencies inherent in penitentiaries. Eric Johnson, an associate of Ellwood’s at the Sixth District Court Technology Office, says that installing Acoustiblok all-weather sound panels in the jail rooms was an instant fix for the audio dysfunction that was causing severe communications problems. Acoustiblok worked so well, in fact, that jail officials have already contracted to have it installed in four remaining videoconferencing rooms. Work was completed in mid-September. The Acoustiblok all-weather sound panel not only absorbs more sound than any other panel made, but also contains the unique Acoustiblok material itself, a 1/8-inch thick heavy mineral-filled viscoelastic material which stops sound from penetrating through it. The UL approved soundproofing material has taken years to develop. Just one thin 1/8-inch layer of Acoustiblok in a standard stud wall can reduce more sound than 12-inches of concrete. the sound, it actually transforms the acoustical energy into inaudible friction energy in a process sometimes referred to as “isothermal adiabatic.” Lead, previously considered the best soundproofing, works on precisely the same basis and has exactly the same STC rating. For more information, call us at 813.980.1400, e-mail us at sales@acoustiblok.com, or visit our website at www.Acoustiblok.com.